As the indoor season wrapped up this past weekend at Nationals, two Maroons added “2013 All-American” to their resume. Fourth-years Billy Whitmore and Julia Sizek—the only two South Siders to make the trip to Naperville—claimed the honor for the second time this year by finishing seventh and eighth, respectively, at the NCAA National Championship. In order to receive All-American honors in indoor track and field, an athlete must place in the top eight at the national meet. Sizek finished with a time of 17:15.21 in the 5,000-meter run to place eighth at the meet. Sizek came into the race with the 11th seed, which she had earned with her time of 17:11.37 from the Warhawk Classic. En route to her All-American performance, Sizek overcame four higher-seeded runners and ran a negative split, running the second half of the race faster than the first. Sizek had intense competition down to the wire as Christy Cazzola of UW–Oshkosh took home the championship by a narrow margin of .09 seconds over Nicole Michmerhuizen. Cazzola’s time of 16.57.58 earned her the first place finish. Sizek finished a comfortable six seconds ahead of the ninth place competitor and All-American cutoff, Kristen Galligan of Washington and Lee. Despite the impressive finish, Sizek still felt she could have run a better race. Even though an athlete’s competitive nature always forces her to look for ways to improve, Sizek remains proud of what she has accomplished. Whitmore, on the other hand, finished seventh in the field of 13 with his time of 14:36.39 in the 5000-meter run. He came into the meet seeded 12th with his time of 14:33.99 from the Leonard “Squig” Converse Invitational. Whitmore overcame five higher-seeded runners in order to achieve his All-American finish. Like Sizek, Whitmore finished comfortably over the All-American cutoff. Whitmore beat ninth-place finisher Peter Kissin of Haverford by just over nine seconds. The men’s race also had a tight finish. Haverford’s Chris Stadler took first with his time of 14:27.74, beating John Crain of North Central by a bit more than a second. Whitmore took the end of his indoor career with grace. 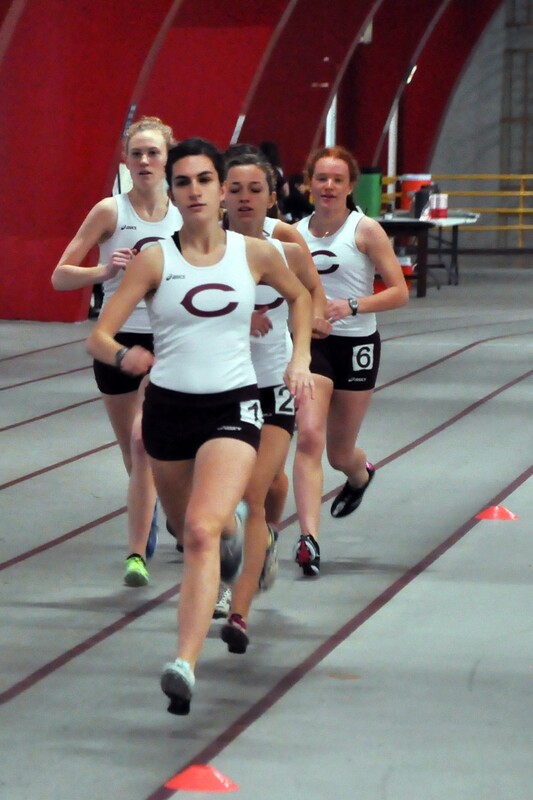 “It was great to end my indoor career at North Central College, a place where I have had success before and is not too far away [so] my family and friends were able to attend,” Whitmore said. Whitmore’s career as an athlete at the University of Chicago has been characterized by success, with numerous All-American performances and top finishes. Like Sizek and Lawton before her, he wishes to inspire current and future Maroons in their own pursuits. “Through hard work and dedication, I hope to continue to set an example for others to follow,” Whitmore said. People often forget that track and field truly is a team sport—even though it is subdivided into mostly individual events. Whitmore and Sizek trained with their fellow Maroons all year long, and their teammates pushed them to victory. “To all who came out to support, thank you! You really do make a difference!” Whitmore said. The South Siders, led by Whitmore and Sizek, will now move on to the outdoor season. While preparation for their teammates began over two weeks ago before Last Chance weekend, Whitmore and Sizek began this Sunday, the day after Nationals. The Maroons will take on the best of the region early next month at the Chicagoland Invitational. There, the quest for more Nationals qualifiers and a conference title will begin anew.